Hoping someone else may have answered by now! There are two notes stacked all the way through this sheet music. It would be better to understand if the top note of each pair had an upward stem, and the bottom a downward stem. Not possible with notes like a semibreve! As there are two notes, it makes it so that each trombonist has his own line to play. Tr.1 plays top notes, tr.2 bottom. hard to get mixed up usually, and on the occasions where both play unison, that's where the stems issue makes things clearer. 12/8? Well, it means there are 12 'little' beats of a quaver (eighth note) are in each bar (measure) - or their equivalent. Usually gets counted 1 2 3 4 5 6 7 8 9 10 11 12. So, a kind of 4 count, with each count split in to 3. Why does this note have a stem pointing up and another pointing down? 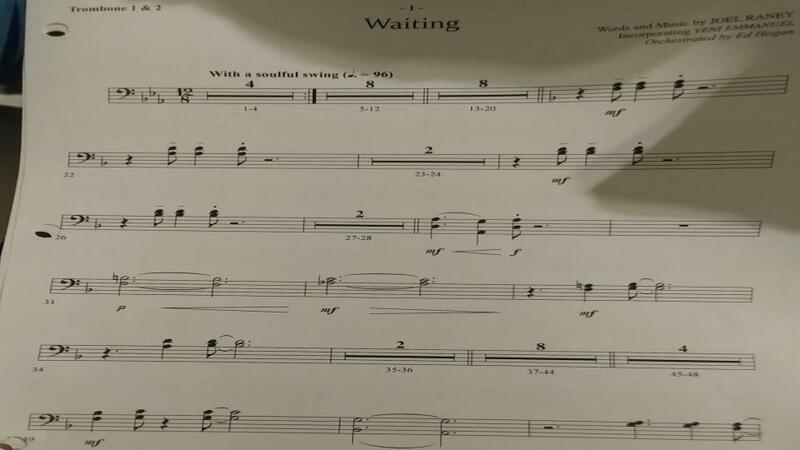 When 2 parts are on the same line, how do I know who plays which part? With regards to piano sheet music, when are you supposed to press the pedal(s)? What are all these symbols in some old sheet music? How to read chords quickly on sheet music? Two whole notes next to each other in a bar?